There is no one size fits all for fishing kayaks, mainly because everyone differs in where they fish and their personal kayak preferences, be it stability, speed, tracking, or weight. I’ll try to highlight the best use for each of the kayaks on our list to steer you in the right direction so you can get the most out of your time on the water. 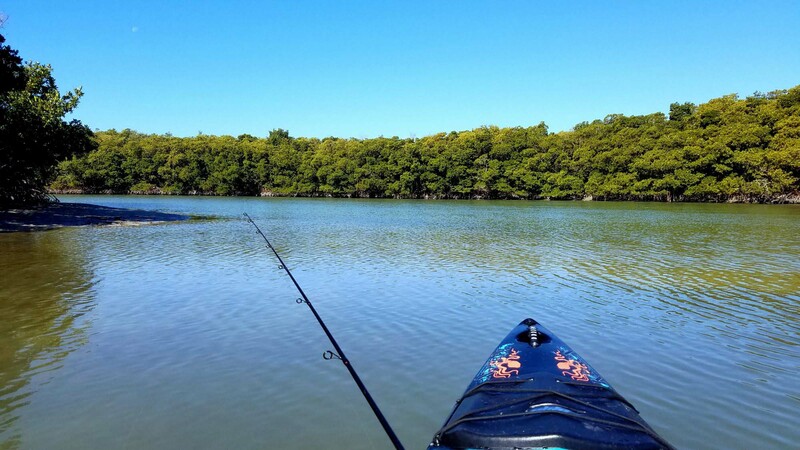 Choosing the right kayak for you all boils down to one thing – where do you fish? Is it a river, a backyard pond, or deep sea on the open water? All of these bodies of water would warrant a different kayak for the most optimal fishing experience. Now it is true that all kayaks float on water and you could theoretically use any kayak for any body of water, but you won’t have the best time doing that. For instance you will love a short wide kayak in the river, but you would curse it trying to break through the surf and paddle distances for offshore fishing. Not to mention that a wide kayak in ocean swells can easily tip and become dangerous, just as a long kayak in a fast river won’t be able to turn quickly and could cause issues. Overall you want to really focus on choosing a kayak for your primary body of water. I think we can agree that both lakes and inshore fishing on flats or backwater areas are quite similar. There are not any swells or waves; instead you will be battling wind and long stretches of open water. There is a mix of kayaks that can accommodate this well. The first type would be a medium to long kayak with a normal width. This will let you paddle long stretches of water with ease and still provide stability as well as great tracking. A perfect example of this would be the Wilderness Systems Tarpon kayaks. They are great all around kayaks that can be had in a 12 and 14 foot model that excel in lakes and flats. Another design anglers are also gravitating toward is wider boat to stand and cast as well as sight fish. These will be slightly slower in the water, but they have more primary stability and offer a great platform for landing fish and storing lots of gear. Look to the Jackson Cuda if you want a bit wider of a boat that is excellent in open water. Fishing conditions offshore can vary wildly, but in general you will experience a rough surf launch and landing as well as constant swells or chop while fishing. For these conditions you need a kayak with a lot of secondary stability and something that can track well or has a rudder to keep you on course in the ocean currents. The kayak also needs to have hatches that seal well to keep the water out and a bow that will cut through waves rather than bounce on them. With all these conditions there are two fishing kayaks that consistently surface as the best offshore platform. This would be the Ocean Kayak Trident 13 Angler and the Jackson Kraken. Offshore anglers heavily favor these kayaks because they are fast, track well, and have a ton of secondary stability which is very important in rough water. For river fishing look for a shorter and more easily maneuverable kayak. You want something that can turn quickly and doesn’t have a deep hull. You don’t want a kayak that tracks, instead look for something up on a rocker so it can pivot easily and drift well. My top suggestion for a river fishing kayak would be the Jackson Coosa. It will turn on a dime, was designed to be able to run small rapids, and it drifts sideways down the river perfectly. Not to mention you can stand in this all day long if you choose. For pond fishing there aren’t any kayaks that won’t work, but you will be better off with something short, wide, and light. You won’t be paddling long distances so the drag in the water doesn’t matter. You also most likely have to cart or carry the kayak to the water so you will want something that is easy to manhandle down the bank and into the pond. Turning in tight spaces will also be easier with a shorter kayak. I would consider the Native Slayer Pro or even something in the ten foot range for pond fishing, maybe a Tarpon 100. There are two basic types of kayaks to choose from, Sit on Top (SOT) or Sit Inside (SIS). Sit on top kayaks are almost always the way to go for kayak fishing. They are more stable, self-bailing, and it’s easy to rig them up. They also are much easier to enter and exit especially on the water, and they are designed to not sink. You can flip it over in the water, then right the kayak and get back in it. Sit inside kayaks are lower to the water and are warmer, however they are not self-bailing and you are in a bit of trouble if you flip one since it will likely be filled with water. Unless you know that you definitely want a sit inside kayak then limit your search to sit on tops. When I first started kayak fishing and was doing research for the best kayak to buy I was certain that I wanted a pedal kayak. My thought was that they’re hands free and I could do so much more fishing if I didn’t have to use a paddle. It was a great thought and a lot of people do go that direction but personally I’m glad I didn’t end up with one for quite a few reasons. Pedal kayaks are typically heavier, they’re more expensive, they take more time to get setup, and they can’t go as shallow as paddle kayaks. Also depending on your model it may not have a reverse gear, so you’ll be pulling out your paddle half the time anyway. There are definitely benefits, such as being able to use your legs to power the kayak while your hands are completely free to fish. This lets you use a major muscle group that has more endurance so you can go further. If I were to paddle long distances on the ocean I would take a good look at pedal kayaks, however most kayak traditionalists prefer a paddled vessel, and I would agree that in general it’s the better platform to fish from. My personal advice would be to avoid tandem kayaks for fishing unless you are bringing a friend along and are planning on paddling and guiding all day. It is very difficult for two anglers to fish from a single kayak, and casting right next to someone else almost always ends up with a hook in the skin. Not to mention that a tandem kayak is much harder to maneuver when you decide to go out fishing by yourself. Instead buy two solo kayaks if you can. With any kayak you buy they have two different types of stability, primary and secondary. Primary stability is how stable the kayak feels when it’s sitting flat on the water. Secondary stability is how stable the kayak feels when it is tipped on its side. Different kayaks will have different amounts of primary and secondary stability based primarily on their hull shape. Often when first looking at kayaks you will get hung up on how ‘stable’ a boat is, meaning it has a high level of primary stability and often very little secondary stability. This is great for flat water, but if you encounter rough water or any waves that boat will quickly flip once it hits the point of no return and you won’t be able to recover it. Ocean kayakers favor boats with more secondary stability because they are less likely to flip and offer a more stable platform in rough water. First of all, don’t buy an inflatable kayak, ever. These are toys that you do not want to be in when a hook, knife, rock, or catfish punctures it. Stick with the rotomolded polyethylene (spin-molded plastic) or thermoformed polycarbonate (heated plastic) for kayaks that will survive well when drifting over and inevitably getting stuck on an oyster bed or submerged log. Other choices for kayak materials are fiberglass, wood, or kevlar, however these aren’t great materials for fishing kayaks since it would either be too expensive (kevlar), too fragile (fiberglass), or too heavy (wood). I’ve never bought a kayak that I haven’t made at least a few changes to as far as adding additional rod holders, installing an anchor trolley, or adding a bait well. Kayaks are just begging to be drilled, outfitted, and customized to your exact specs. A lot of kayaks sell a basic model and an angler model. The only difference is a few hundred dollars and some flush mount rod holders. If you’re handy with a drill and have the time then opt for the basic model and outfit your kayak as you see fit. The Jackson Kraken is an awesome kayak that has so many features geared for anglers it’s hard to know where to start. Just as a full disclosure this is my personal kayak of choice that I primarily use for all my fishing trips. The Kraken is designed and marketed as a big water fishing kayak and the adjustable seat letting you move forward and backward in the boat allows you to adjust the weight load for a bow high or more level ride depending on conditions. Starting at the front the bow hatch has a plastic cover as well as a neoprene cover under that to make it waterproof for cutting through the surf. The center hatch acts as a rod pod or storage area for a fish bag and it has gear trac running down both sides of the hatch. There is also gear trac on the front bow, back crate area, and right behind the seat. The kayak is rudder ready, though I personally feel it doesn’t need one because it has a nicely designed hull that keeps it on course when paddling. On the bottom of the boat is a center supper that is designed to fit a large transducer for mounting your fish finder. No need to hang it off the side or do any drilling, it should fit right in. The Kraken is superb and you cannot go wrong with this kayak. The Trident 13 Angler was born and bred for the ocean. The kayak is the perfect blend of length, width, maneuverability, and stability. Starting at the bow there is a watertight front hatch for tons of dry gear storage. Then you move down and Ocean Kayaks has incorporated a fish finder cover to shade the sun and provide a convenient place to house your kayak electronics. One of the best features of this kayak I feel is the rod pod hatch in the center. Not only does this let you store your rods or other gear within the hull of the kayak for safe beach to beach launches, but it also has flush rod holder mounts so you can customize exactly how you want your rods to be setup. The two cutouts in the lid are also very handy for throwing spare hooks and weights. The seat on this kayak is not as comfortable as others I have used, however there are a lot of good aftermarket seats that fit perfectly, such as the Surf to Summit models. The seat is also lower than a lot of kayaks which works well with this design because it lowers your center of gravity and lets you get down on the water with more stability and less wind resistance. The cargo area on the Trident 13 is huge. It has an initial smaller section close to the seat that can hold a bait bucket or small tackle boxes, then a large and long cargo area attached that can fit a lot of fishing gear. The features on the Trident are awesome and there is a lot of open deck space for rigging it to your liking, but where the kayak really excels is in rough water and breaking through waves due to the bow shape and the deep keel. If you’re going offshore or chasing big fish I would undoubtedly choose the OK Trident. I’m almost certain everyone reading this knows that the Tarpon 120 would make this list. It is the workhorse of fishing kayaks with tons of great reviews and an awesome design. The Tarpon 120 platform is so popular that it has been copied by many other kayak companies and it has stood the test of time. This kayak is tough, comfortable, tracks well, and turns easily; what else could you ask for? There isn’t anything overly fancy about the Tarpon, but it will do what you want and get you where you need to go. A few cool things about the Tarpon kayaks are that they have the rubber mesh side pockets which are perfect for tucking spare lures, pliers, or anything you have on hand and don’t want to lose through the scuppers. Also the center beam of the kayak is perfect for a rod holder and makes mounting it a no-brainer. The rear cargo area is also large which is great for extended trips or securing a milk crate for fishing. Note that Tarpon 130x has just been released recently and is quite similar but with a few key differences; it is about a foot longer, 2” wider, has an upgraded seat, costs $350 more, and has an area to incorporate a pedal propulsion system. The Jackson Cuda is the quintessential fishing kayak. Remember what I said about not being able to have everything in a single kayak? Well it has everything. I am exaggerating, however the Cuda is a great kayak that I’ve fished from many times and I’ve come away impressed every time. It just feels natural to fish from and it is stable enough to stand in but also not so overly wide that you feel like you’re paddling a barge. The Cuda will get up to speed easily and tracks so well. One feature that Jackson incorporates into all their fishing kayaks is the replaceable skid plate on the stern of the boat. This lets you replace a $5 part rather than wearing through the hull after many launches and landings. Jackson also was the first to develop the hi/lo seat, which is not only super comfortable, but gives you two options for the kayak seat placement. The deck of the kayak also feels very well laid out. There are several grooves in the front section to hold the tip of your fishing rods when you put them down quickly, and there are lots of areas up front to add custom camera mounts and gear. The Jackson Cuda comes in a 12 foot and 14 foot model. If you buy the Cuda I can guarantee you won’t be disappointed. This kayak is a great choice for a lower budget if you want to get your feet wet, in a manner of speaking. I have fished from it many times and it feels very similar to the Tarpon 120 just without the extras. It is a basic kayak but it tracks well, paddles fast, has rod holders, and will get you out on the water and fishing. Perception also makes a Pescador Pro Angler which is another $100 extra and includes an upgraded seat and center console insert. The hatch and rod holders are also different. Personally at this price point I don’t feel it’s worth it and would stick with the basic model until you are ready to upgrade. One thing I really like about this kayak is that it rides fairly low in the water so the wind isn’t as much of a factor, but this does mean you may get a bit wet. Let’s be real though, if you’re kayak fishing you’re prepared to get wet and have fish guts and blood on you. Overall the Pescador has good bones and is worth a look if you’re in the market. The Caribbean 14 Angler kayak is not as mainstream as the other brands you see on this list, but it has so much going for it, namely it being a 14 foot kayak that weighs in at only 50 lbs! That’s crazy light and definitely noticeable. The other kayaks in the 14 foot range on our list come in at least 15 – 30lbs heavier. It also is offered is so many different colors, I’m seeing nine on their website, and it just looks phenomenal. The Caribbean 14 is a fast and stable kayak with a hull designed for efficiency, tracking and maneuvering. It has built in flush mount rod holders as well as gear trac laid into both side rails so you can mount and adjust rod holders, electronics, and a lot of other gear very easily. The Cloud 10 seat is also an eye catcher, offering a comfortable and dry ride. The price for this kayak may run higher than some others, but when you consider that it’s a lightweight model, comes with an upgraded seat, and has gear trac and rubber padding already laid I think it starts to even out. While you may not see the Eddyline Caribbean Angler in a store it is readily available online and is definitely worth a look if you’re considering a new fishing kayak, especially if you’re looking to shed some weight. The Native Slayer 12 Pro has some unique features that make it a real stand out kayak on this list. First of all, it has a tag along wheel bolted to the back of the kayak which let’s you easily move it by yourself to your launch point. I’ve seen this popping up on a few kayaks and it seems like a good idea, time will tell. Also something you don’t see often is the hatch up front can be used open and basically doubles as a front cargo area where you could keep coolers, fish, bait, an anchor, or a cast net. It has scupper holes and everything so leaving the hatch lid off won’t sink your kayak. The Slayer also has an adjustable high/low seat and a stable platform to stand and fish from. Don’t forget about your electronics; Native has designed the Slayer 12 Pro with an electronics console box right up front which is perfect for running wires and mounting fish finders. Something you are sacrificing with the Slayer is below deck storage, so it may not be prime for areas with rough water, but there is a whole lot packed into this kayak and it should be on your list to demo. The Jackson Coosa is a fly fisherman’s dream. It is compact, super stable, and it is ultra-maneuverable. This kayak excels on rivers and was designed by Drew Gregory to be able to run rapids as well. The hull is strong, well designed, and super buoyant. The reason this kayak does so well on rivers is because of the rockered hull where essentially most of the kayak weight is supported in the center allowing for quick turns when needed. The back cargo area I can confirm is large enough to fit a standard sized milk crate and it is held in quite nicely by the bungee cords. Standing in this kayak is not a problem at all and you can be comfortable and balanced while standing for long periods of time. It also has a stand assist rope as well securely mounted to the front center which helps you getting up and down from the seated position while on the water. The Coosa also features drag chain recesses on the stern as you can see from the top view. This lets you drop two drag chains to slow down your river fishing. This kayak is a fishing machine and it is also a very dry ride. If you’re look to fish for bass on rivers, don’t look any further. Hobie is one of those brands that definitely has a cult following and for a good reason, they make some top of the line kayaks. I wouldn’t lump myself into the Hobie club, but that’s probably just because I don’t have enough money to afford their expensive pedal kayaks priced well over the $2000 mark. Nevertheless, Hobie makes some great kayaks that have consistently excellent reviews and the Hobie Quest 13 is one of them. It is one of the few Hobie’s that is not a pedal or tandem kayak and as such it is perfectly suited for some serious fishing. Hobie hit the nail on the head here with the perfect length to width ratio. A kayak that’s 13 feet and has a 28.5” beam is such a great compromise between stability and speed. It tracks so well and feels like it’s gliding across the water. There are also some great curves on this kayak with the keel and bow design. One thing that I’d like to see would be an angler edition with gear trac and rod mounts, however a quick google search will show you where other fishermen have modified their kayak very easily to get it rigged up for fishing. The Quest 13 is a great base platform to modify into a full-on fishing kayak and it comes at what I feel is pretty reasonable price as well. The Native Ultimate is the only sit in kayak on this list. What this means is you will have to bail out some water if you’re a sloppy paddler, but you can also store so much more gear in the kayak. I mean it has a capacity of 600lbs, and I would be willing to bet that it could carry more if it had to. The kayak is truly designed a bit more like a canoe than a kayak, and where it really excels is the height it sits off the water and the ease at which it glides along. I’ve stalked reds on the flats in this kayak and it is brilliant for quiet and fast paddling, just be careful not to bang the sides with your paddle. Oh yeah, and you can stand up, the whole time, quite easily in fact. Check out the foot pads in the picture, and note how the center is raised a bit, almost like where you’re standing are pontoons. This makes the kayak so dang stable and perfect for sight fishing the flats. The Native Ultimate 15 is a large boat and tips the scales at 81 lbs, however it is also one of the best sit in fishing kayaks out there. I would seriously consider this kayak for a multi-day fishing and camping trip or if you do a lot of sight fishing. Malibu offers one of the widest kayaks on the market with a width of 33”, and it capitalizes on every inch of that by having standing platforms that double as gear pockets spread wide across the kayak. The Malibu Stealth 14 also has a total of four flush mount rod holders (two front, two back) and a large gator hatch up front that has a molded child seat. There is also a huge rear hatch and a lot of storage area for gear. Not to mention that the capacity load of 550 lbs means that even a large kayaker will be staying quite dry. This kayak will plow some water and take some time to turn so it’s not going to be the fastest thing around, but it has so much primary stability that you could do a quite a bit of walking around on the deck. One very unique feature here is that the center oval hatch is actually a bait tank system that you can rig up to pump water in. You can keep live bait right within reach and even use it as a live well if your catch is the right size. Malibu has also been making updates to this kayak and has a new design coming out this year with a new seat, hatch, and rear cargo area. The priced has increased as well from $1299 to $1699 so keep an eye out for discounted older models and see if these changes warrant the price increase.